Ten days ago, I did something incredibly -- and somewhat unexpectedly -- impacting. 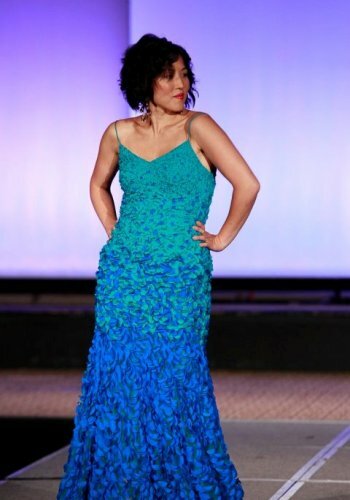 I walked a runway with a wonderfully talented, diverse, and ready-for-anything group of women bloggers in BlogHer's first fashion show. And while yes, from the perspective of a working mom who usually has 15 minutes to take care of clothes, hair, and makeup (10 of which typically involve prying Violet off my leg or out of my cosmetics drawer) it was awesome to be styled and beautified, this event ended up opening the door for an amazing conversation with Laurel about body image, confidence, and -- in a phrase best reflected by my friend Karen Walrond -- the beauty of different. This is a conversation I've been planning on having with Laurel at some point. I grew up with the bluntness of a Korean culture where relatives had no problem telling me if my skin looked terrible, my chest underdeveloped, or my weight too hefty. I endured an emotionally abusive relationship right out of high school that pushed me to the brink of an eating disorder. I'm now in a positive body image space (thanks to a lot of my own internal work and growth + the unconditional support and love of Jon), but I'm a woman and the mom of two daughters so I'm acutely aware of the emphasis put on all things physical. People often tell me how beautiful Laurel and Violet are, and while yes, that is true, I always want my girls to know that they are more than that...and that there is more to everyone. That beauty has myriad dimensions -- some of which shine at unexpected moments. 1. Use a topic of interest as the springboard for a deeper conversation. I wasn't originally planning to delve into deep topic matter, but it quickly became clear as I started to describe the runway show and answer Laurel's questions that hinging conversations about body image, diversity, and confidence to a topic she adores (fashion) was incredibly useful. I think the same could be done around other topics of interest and role models your kids are tuned in to. 2. Be calm. This is pretty much my basic parenting mantra -- all conversations seem to go better and result in more heard words if you can be calm. If the subject matter is emotionally charged for you (as this one was for me), take a breath before you dive in, and take several more along the way. 3. But allow for emotional moments too. I will admit, I got teary at times during this conversation -- particularly when I talked about the diversity of the models, including the fact that the first blogger model to hit the runway rocked it big time in a wheelchair. Laurel and I talked about how different this was from what we usually see in fashion and when she said, "Mom, I love that everyone could be included!" I nearly yelled "HELL YES!" I think my emotion on this subject helped convey the importance of the topic. 4. Share something personal (in an age appropriate way). Jon and I have found that Laurel gains lessons (and sometimes confidence) when we share something personal, even -- perhaps especially -- if it's challenging and painful. Since she's only 7 years old and not fully immersed in the self-conscious phase, I didn't feel like it was the right time to talk about eating disorders (though I do plan on doing this in the future), but I was able to share how incredible it was to be celebrated in this show after so many years of being made fun of as a kid for being Asian in a predominantly Caucasian community. 5. Share that mistakes are OK. Laurel is, as far as I can tell, a perfectionist and I've worked a lot on reinforcing that perfection is not everything and that you can gain a lot of strength from making mistakes. She was rapt (and actually gasped) when I shared how I was walking in the show in very tall Vivienne Westwood heels and that in my first look, just as I was leaving the stage my ankle wobbled and I heard a gasp from the crowd. When I got backstage to change into my second look, I was a little rattled and asked someone if I could change shoes and (understandably) they said no, there was no time. So I just quickly changed, scampered into position, took a breath, and told myself, If you fall, you fall. And you will wake up tomorrow and the world will still be spinning. Go do this thing! 6. Talk about stretching out of the comfort zone. I love fashion so for me, the biggest stretching out of my comfort zone was wearing clothes that I might not necessarily have picked in a store myself (more evidence for why it would be great to shop with a friend or personal stylist!). But for several women I talked to, this was major. It was scary. But signing up for it and doing it was huge. And incredibly empowering. I talked with Laurel about how much you can gain from stretching out of your comfort zone -- a particularly relevant topic for her since she tends to shy away from the unknown or things she's not already skilled at. Apparently the combination of chartreuse and leopard print inspires me to shake my rump in public. I don't own a single bright blue article of clothing; I think it's time to rectify that situation. You can also see a closeup of my hair and makeup on Elle (yes, I kind of fell of my chair when I found out I was on the Elle blog). And now I must issue thanks: To makeup artist Lynette for beautifully applying the Elizabeth Arden products (seriously, I'm going to buy a case of their 8 hour lip color -- it lasted from 4pm through drinks, snacks, and dancing, and until I finally washed my face at 2am!). To Kathleen of Raika Studio for Paul Mitchell for the insane rock star finger waves. To the stylists who pulled the fantastic day and night looks from 6pm.com. To the amazing Kathryn Finney who coordinated the show in tandem with BlogHer. To BlogHer, for adding this program to what was clearly already a busy and full conference agenda. To my friend Leslie (image credit #1), whose photo gave me new confidence in my legs. To the talented Mark Von Holden, who captured the full length shots. And finally, to the amazing group of women who shared this experience with me on the runway and inspired the above conversation, and to all of the show attendees who cheered us on. this Elizabeth Arden Facebook album, as well as this BlogHer post. Totally awesome.